Seems that on developed countries when strange things happen people get worried. Well, Steve Pepper, the chairman of SN/K185 - the "Norwegian mirror committee to ISO/IEC JTC 1/SC 34" - for 13 years is worried with the state of affairs on Standard Norge. In fact, he is worried enough to have lead a public demonstration in front of an SC34 meeting in Oslo. 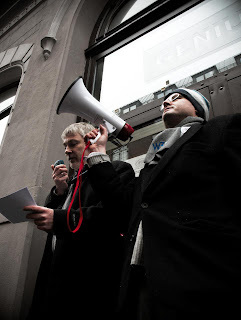 When someone that chaired a Tecnhical Comitee for 13 years goes in public with a megaphone... one starts to wonder. Among the demonstrants was Hakon Lie , who invented CSS, and many other known and unknown Norwegians.